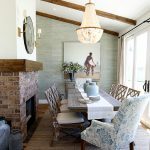 Last week we saw the fabulous turquoise and lilac girl’s room in this year’s Pasadena Showcase House of Design, and today we’re visiting the boy’s room by Santa Barbara-based interior designer Debra Lynn Henno with photography by Alexander Vertikoff. 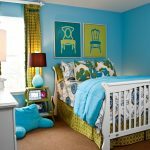 The loft bed and built-in dresser & desk pre-existed and were built years ago to conceal part of a stairwell when the owners did an addition to the home. I love what Debra did with it! 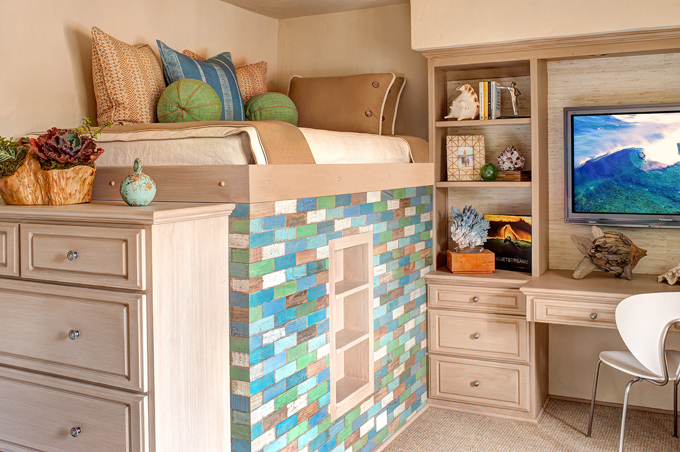 How cute is the colorful boatwood siding the bed? It was all hand-painted in Indonesia, inspired by all the fabulous fabrics. I love all the natural textures here too. 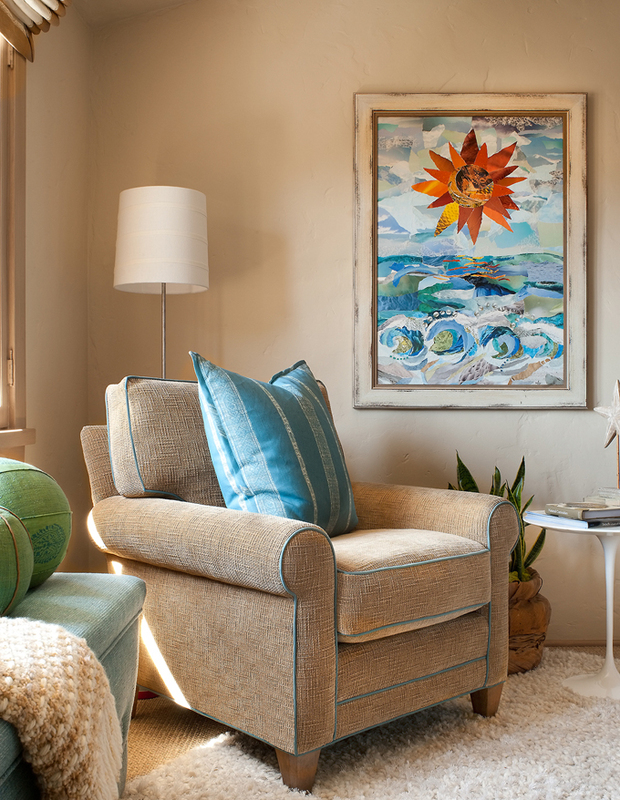 With that and the great colors, there’s a beachy vibe I’m totally digging! Head on over here to see more designs by Debra! Very cute! Such great attention to detail! What a fun space!! I love the colors! Love the colorful boatwood siding! But what really caught my eye was the beautiful artwork that was chosen!! I would love every piece for my own home! Love the details in this design. I love to see art displayed in design rooms. This is an inspiration for me. Little hide away under the bed….. very clever. I think the door is the book case. The room looks gorgeous! The variety of blues against the soft beige's brings an elegance and peacefulness to the beautifully designed bedroom. The blue coral on the desk is my favorite touch. A job well done to Debra Lynn Henno! WOWWW this is the coolest boys room I have seen in a long time! Really cool vibe about it! Debra you are truly talented!! 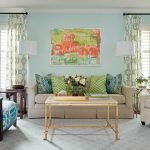 Love how fresh and bright the room is, such a fun room! Wonderful work Debra! Such a fun and playful space!! 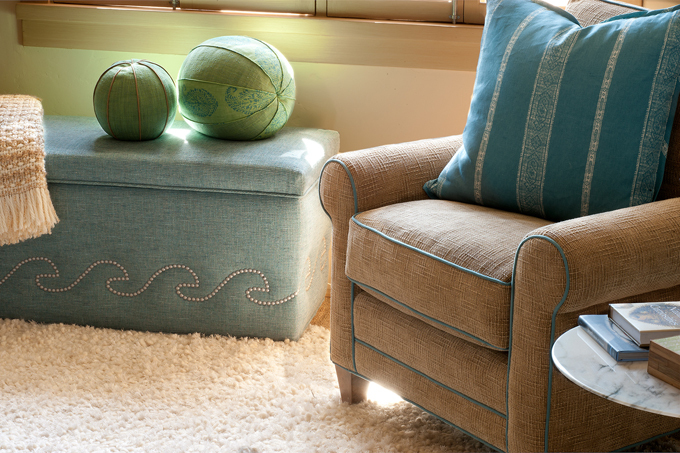 The pops of blue, turquoise, and green, all plays off one another phenomenally! what little boy wouldn't want to have this room!?! I love that bench and chair, where is it sold?